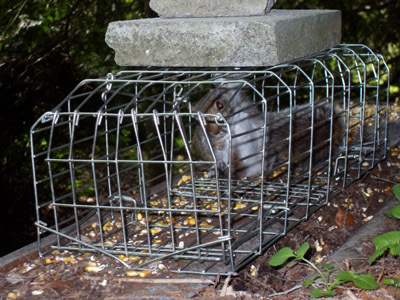 Live trapping involves attracting squirrels to a trap with food (bait). Many types of bait have been compared, including wheat, rice, peanuts, peanut butter, walnuts, acorns and hazelnuts and more recently lure, but yellow whole maize has proved to be the best all round bait especially in woodland situations. Grey Squirrels will only eat the kernel and is a good activity monitor as well as bait. Not only is it a favoured food, but it is readily available in quantity, is relatively cheap, stores well and is very visible to squirrels when scattered on the ground. 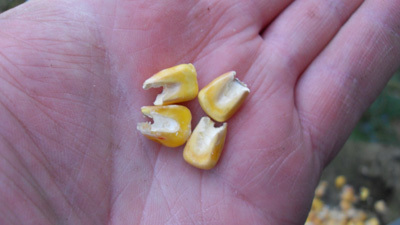 Uniquely, grey squirrels only eat the germ of the maize grain and discard the remainder. 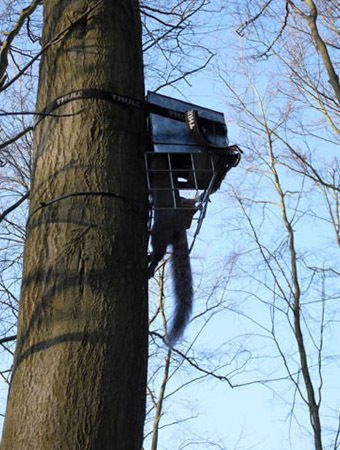 This can be used to advantage to show whether squirrels have visited a trap site. The maize bait can be supplemented with a small quantity of acorns, walnuts, peanuts or hazelnuts to increase its attractiveness at times when squirrels are difficult to trap. In areas of high songbird populations hazelnut or walnut oil will prove to be very effective in pulling squirrels into traps but has no visual pull to birds.